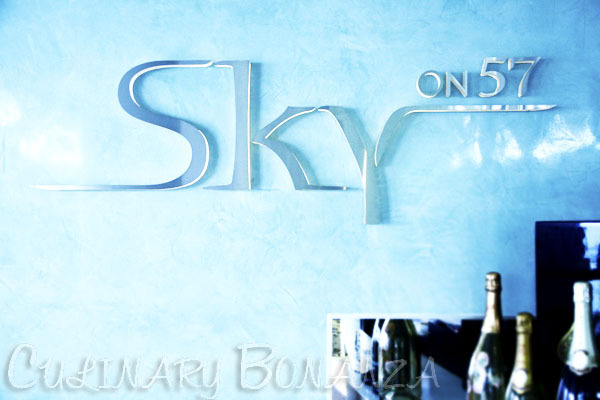 Our group breakfast with Mr. Tamir Shanel, Vice President of F&B Marina Bay Sands was arranged in one of the private rooms at Sky on 57. We had been here the previous day for lunch and it was such a pleasurable feast, so I expected the food to be nothing less for the breakfast. 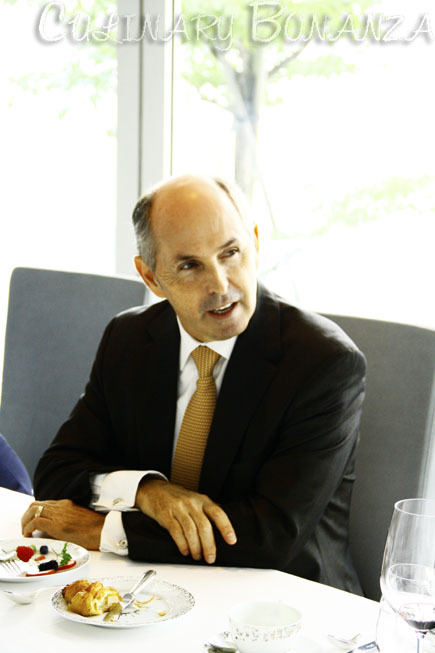 Mr. Shanel has been supervising the F&B operations at Marina Bay Sands since the integrated resort began its operations in 2010. 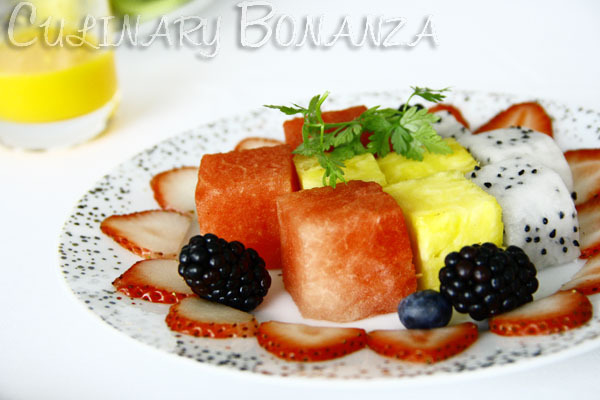 Having more than 30 years of experience in the industry at different locations in Europe, USA, Canada and Asia, Mr. Shanel also initiated the celebrity chef program in Marina Bay Sands. This initiative proved to be very well received that within only 2 years, 5 out of the 6 celebrity chef restaurants are mentioned by the prestigious The World's 50 best restaurants list. Waku Ghin managed to clinch No. 39 position and the 4 others (db Bistro Moderne, CUT by Wolfgang Puck, Sky on 57 as well as Osteria Mozza and Pizzeria Mozza) receive an equally respectable title as "academy recommended" in the regional spotlight list. When I entered the room, some of us were already seated and even almost finished eating. As I manoeuvered around the rectangular table, I chose to sit at the end of the long side by the glass windows, next to Graham Pearce of Viva Asia Travel & Food. Graham had the Egg "Benedict" and his un-recommendation was enough to make me steer clear from that item. The breakfast started with bread rolls and buns being passed around. 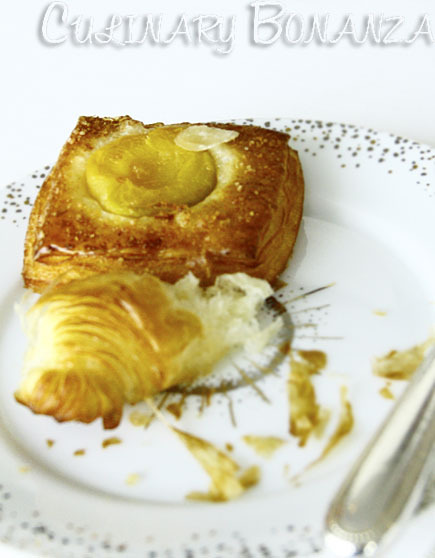 Too bad there's no pain au chocolat, so I chose the croissant and peach danish. Then the fresh fruits came. It's a platter of beautifully arranged and vibrantly coloured fruits. These fruits must be the top picks of the crop, because they are very scrumptious! My favourite pick was the blueberries, too bad there were only a few blueberries on my plate. According to the staff, the Laksa is quite a popular breakfast item here. I'm lucky that my tummy isn't fussy, so it can stomach spicy food even as early as breakfast. Soon after ordering, Mr. Shanel entered the room. Much to my surprise, he settled next to my chair! I almost felt like jumping out of my seat and moving to another unoccupied chair. Alas, I decided to take my chances , although it was quite tiring having to lean and face to my right almost the whole time when he's talking. I had my food to distract me occasionally, but even that proved to be a challenging feat. How to eat laksa and still look demure before the Vice President of F&B of Marina Bay Sands? Laksa is the kind of food that you shamelessly slurp up and possibly burp out loud at the end of the last drop of rich gravy as a sincere expression of gratitude for such a heavenly dish. As Mr. Shanel continued sharing and some of us asked some questions, my Laksa came. I had no idea how I was supposed to eat, with Mr. Shanel constantly turning to face my direction (Graham was clearly not holding back with his string of questions). After taking some less-than-satisfactory photos of the laksa, I disengaged my inhibitions and just started twirling the thick rice vermicelli noodles with my pair of chopsticks. It tasted so blissfully rich and spicy and tasty! The noodles were slippery enough to slide into the mouth effortlessly and it's pleasantly chewy, or to borrow an Italian term, al dente. 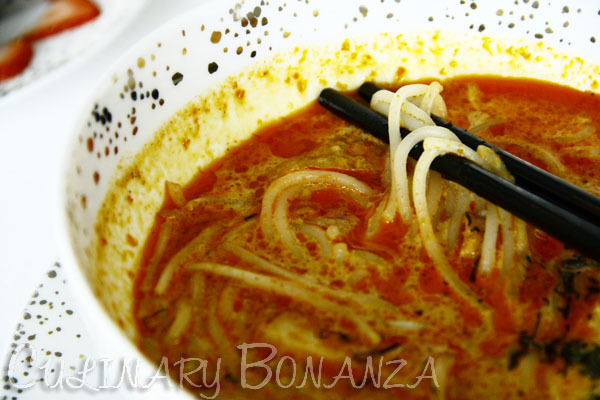 The broth was especially rich, no wonder JQ's Laksa is dubbed as Taiwan's best laksa! The topic of the talk (not so much of a conversation) then progressed to wine and shortly after, a bottle of wine was presented at our table, which was soon uncorked for all of us to taste. 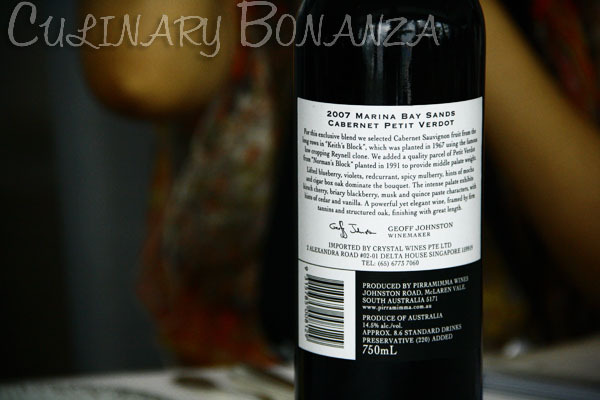 The award-winning 2007 Marina Bay Sands Cabernet Petit is exclusively created for Marina Bay Sands from its producers in Australia. 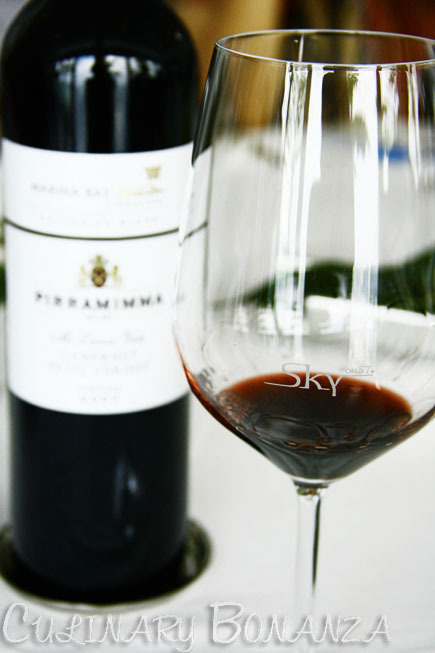 From my amateur tongue, the wine tasted unusually savoury, something I had never some across in wine before. Such experience left me in wonder about its unique property.